This example demonstrates a trail with a nonbinding acceptance boundary. The design is similar to the design in Example 90.1, but has a nonbinding beta boundary. A clinic is studying the effect of vitamin C supplements in treating flu symptoms. The study consists of patients in the clinic who have exhibited the first sign of flu symptoms within the last 24 hours. These patients are randomly assigned to either the control group (which receives placebo pills) or the treatment group (which receives large doses of vitamin C supplements). At the end of a five-day period, the flu symptoms of each patient are recorded. Suppose that you know from past experience that flu symptoms disappear in five days for of patients who experience flu symptoms. The clinic would like to detect a symptom disappearance with a high probability. A test that compares the proportions directly specifies the null hypothesis with a one-sided alternative and a power of 0.90 at , where and are the proportions of symptom disappearance in the treatment group and control group, respectively. The following statements invoke the SEQDESIGN procedure and request a four-stage group sequential design by using an O’Brien-Fleming method for normally distributed data. 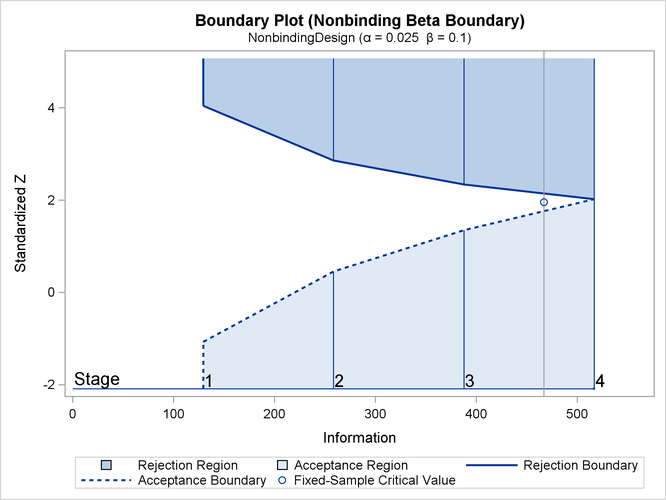 The ALT=UPPER option specifies a one-sided alternative hypothesis, and the STOP=BOTH option specifies early stopping to reject or accept the null hypothesis , The BETABOUNDARY=NONBINDING suboption requests nonbinding beta boundary to have the flexibility to continue the trial when a test statistic falls in the acceptance region at interim stages (Zhu, Ni, and Yao, 2011, pp. 132–133). The ODS OUTPUT statement with the BOUNDARY=BND_COUNT option creates an output data set named BND_COUNT which contains the resulting boundary information for the subsequent sequential tests. The "Design Information" table in Output 90.9.1 displays design specifications. With the specified alternative hypothesis , the maximum information is derived to achieve a power of 0.90 at . The derived fixed-sample information ratio 1.107 is the maximum information needed for a group sequential design relative to its corresponding fixed-sample design. Compare to the default BETABOUNDARY=BINDING option, the BETABOUNDARY=NONBINDING option requires a larger sample size for the design. The "Boundary Information" table in Output 90.9.2 displays the information level, alternative reference, and boundary values at each stage. With the default BOUNDARYSCALE=STDZ option, the SEQDESIGN procedure displays the output boundaries with the standardized normal Z scale. With ODS Graphics enabled, a detailed boundary plot with the rejection and acceptance regions is displayed, as shown in Output 90.9.3. The horizontal axis indicates the information levels for the design. The stages are indicated by vertical lines with accompanying stage numbers. If the test statistic at a stage is in a rejection region, the trial stops and the hypothesis is rejected. If the test statistic is in an acceptance region, then the trial either stops to accept the hypothesis or continues to the next stage. If the statistic is not in a rejection or an acceptance region, the trial continues to the next stage. The boundary plot also displays the information level and critical value for the corresponding fixed-sample design. The solid and dashed lines at the fixed-sample information level correspond to the rejection and acceptance lines, respectively. The "Error Spending Information (Nonbinding Beta Boundary)" in Output 90.9.4 displays cumulative error spending at each stage for each boundary. With a nonbinding beta boundary, the spending at each stage is computed by using the boundary only. With the SAMPLESIZE statement, the maximum information is used to derive the required sample size for the study. The "Sample Size Summary" table in Output 90.9.5 displays parameters for the sample size computation. where and . By default (or equivalently if you specify REF=PROP in the MODEL=TWOSAMPLEFREQ option), the required sample sizes are computed under the alternative hypothesis. See the section "Test for the Difference between Two Binomial Proportions" in the chapter "The SEQDESIGN Procedure" for a description of these parameters. The "Sample Sizes (N)" table in Output 90.9.6 displays the required sample sizes at each stage, in both fractional and integer numbers. The derived sample sizes under the heading Fractional N which correspond to the design are not integers. These sample sizes are rounded up to integers under the heading Ceiling N. In practice, integer sample sizes are used, and the information levels increase slightly. Thus, 56, 111, 166, and 222 patients are needed in each group for the four stages, respectively. Suppose the trial follows the study plan, and 56 patients are available in each group at stage 1. The data set count_1 contains these 108 patients. Output 90.9.7 lists the first 10 observations of the data set. The Trt variable is a grouping variable with value 0 for a patient in the placebo control group and value 1 for a patient in the treatment group who is given vitamin C supplements. The Resp variable is an indicator variable with value 1 for a patient without flu symptoms after five days and value 0 for a patient with flu symptoms after five days. Output 90.9.8 displays the treatment effect at stage 1. The BOUNDARY= option specifies the input data set that provides the boundary information for the trial at stage 1, which was generated in the SEQDESIGN procedure. The PARMS=PARMS_COUNT1 option specifies the input data set PARMS_COUNT1 that contains the test statistic and its associated standard error at stage 1, and the TESTVAR=TRT option identifies the test variable TRT in the data set. 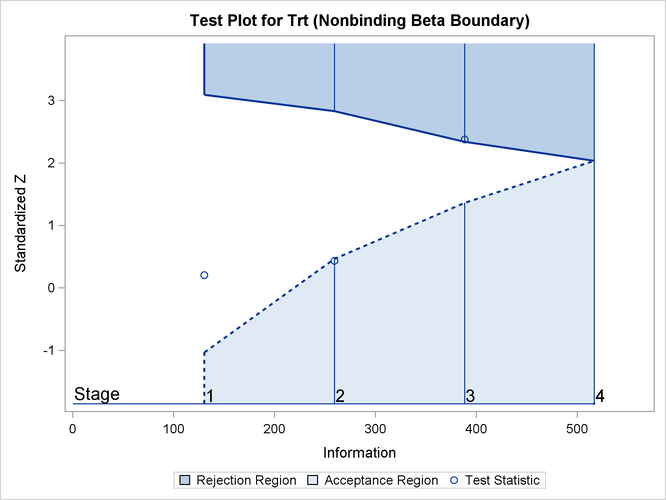 The BETABOUNDARY=NONBINDING option requests nonbinding beta boundary to have the flexibility to continue the trial when the test statistic falls in the acceptance region at stage 1. The INFOADJ=NONE option maintains the information levels at future interim stages (2 and 3) as provided in the BOUNDARY= data set. The default BOUNDARYSCALE=STDZ option displays the output boundaries in terms of the standardized normal Z scale. The O’Brien-Fleming design is conservative in early stages and might not be desirable in a clinical trial. The ERRSPENDMIN=0.001 option specifies the minimum error spending at each stage to be 0.001, and it might increase the corresponding nominal p-value in early stages for the trial. The default BOUNDARYSCALE=STDZ option uses the standardized normal Z scale to display test statistics in the boundary table and boundary plots. The ODS OUTPUT statement with the TEST=TEST_COUNT1 option creates an output data set named TEST_COUNT1 which contains the updated boundary information for the test at stage 1. The data set also provides the boundary information that is needed for the group sequential test at the next stage. The "Design Information" table in Output 90.9.10 displays design specifications. The derived statistics, such as the overall and levels, are derived from the specified maximum information and boundary values in the BOUNDARY= data set. Note that with a minor change in the information level at stage 1, the power also changes slightly from the design provided in the BOUNDARY= data set. With the ERRSPEND option, the "Error Spending Information" table in Output 90.9.11 displays cumulative error spending at each stage for each boundary. By default (or equivalently if you specify BOUNDARYKEY=ALPHA), the Type I error level with nonbinding beta boundary is maintained. Furthermore, with the ERRSPENDMIN=0.001 option, the spending at each stage is greater than or equal to 0.001. The "Test Information" table in Output 90.9.12 displays the boundary values for the design, test statistic, and resulting action at each stage. With the default BOUNDARYSCALE=STDZ option, the standardized normal Z scale is used for the test statistic and boundary values. The table shows that the test statistic 0.2039 is between the upper and boundaries, so the trial continues to the next stage. 0.5000 258.5148 2.41176 0.45564 2.84016 . 0.7500 387.7722 2.95379 1.36069 2.34211 . 1.0000 517.0296 3.41074 2.03599 2.03599 . By default (or equivalently if you specify PLOTS=TEST), the "Test Plot" graph displays boundary values of the design and the test statistic at stage 1, as shown in Output 90.9.13. It also shows that the observed statistic is in the continuation region. The observed information level at stage 1, , is slightly larger than the target information level at the design. If an observed information level in the study is substantially different from its target level in the design, then the sample sizes should be adjusted in the subsequent stages to achieve the target information levels. Suppose the trial continues to the next stage, and 111 patients are available in each group at stage 2. The data set COUNT_2 contains these 222 patients. Output 90.9.14 displays the test statistics at stage 2. The ODS OUTPUT statement with the TEST=TEST_COUNT2 option creates an output data set named TEST_COUNT2 which contains the updated boundary information for the test at stage 2. The data set also provides the boundary information that is needed for the group sequential test at the next stage. The "Test Information" table in Output 90.9.15 displays the boundary values, test statistic, and resulting action at each stage. The table shows that the test statistic 0.43522 is less than the corresponding upper beta boundary value, so the trial can be stopped to accept the hypothesis. With the BETABOUNDARY=NONBINDING option, The clinic has the option to continue the trial while still maintaining the Type I error level. 0.7500 387.7722 2.95379 1.36018 2.34294 . 1.0000 517.0296 3.41074 2.03610 2.03610 . With ODS Graphics enabled, the "Test Plot" is displayed, as shown in Output 90.9.16. The plot displays boundary values of the design and the test statistics at the first two stages. As expected, the test statistic at stage 2 is in the "Upper Acceptance Region" below the upper beta boundary. Suppose the clinic decides to continue the trial, and at the next stage, 108 patients are available in each group at stage 3. The data set COUNT_3 contains these 332 patients. Output 90.9.17 displays the test statistics at stage 3. The "Test Information" table in Output 90.9.18 displays the boundary values, test statistic, and resulting action at each stage. The table shows that the test statistic 2.37437 is greater than the corresponding upper alpha boundary value, so the trial stops to reject the hypothesis. 1.0000 517.0296 3.41074 2.03658 2.03658 . With ODS Graphics enabled, the "Test Plot" is displayed, as shown in Output 90.9.19. The plot displays boundary values of the design and the test statistics at the first two stages. As expected, the test statistic at stage 3 is in the "Upper Rejection Region" above the upper alpha boundary. After a trial is stopped, the "Parameter Estimates" table in Output 90.9.20 displays the stopping stage and the maximum likelihood estimate of the parameter. It also displays the p-value, median estimate, and confidence limits for the parameter that correspond to the observed statistic by using the specified sample space ordering. The MLE statistic at the stopping stage is the maximum likelihood estimate of the parameter and is biased. The computation of p-value, unbiased median estimate, and confidence limits depends on the ordering of the sample space , where k is the stage number and z is the observed standardized Z statistic. By default (or equivalently if you specify ORDER=STAGEWISE), the stagewise ordering that uses counterclockwise ordering around the continuation region is used to compute the p-value, unbiased median estimate, and confidence limits. As expected, the p-value is less than 0.025, and the confidence interval does not contain the null reference zero. See the section Available Sample Space Orderings in a Sequential Test for a detailed description of the stagewise ordering.